Landscape or building? Or an abstracted landscape as a building? 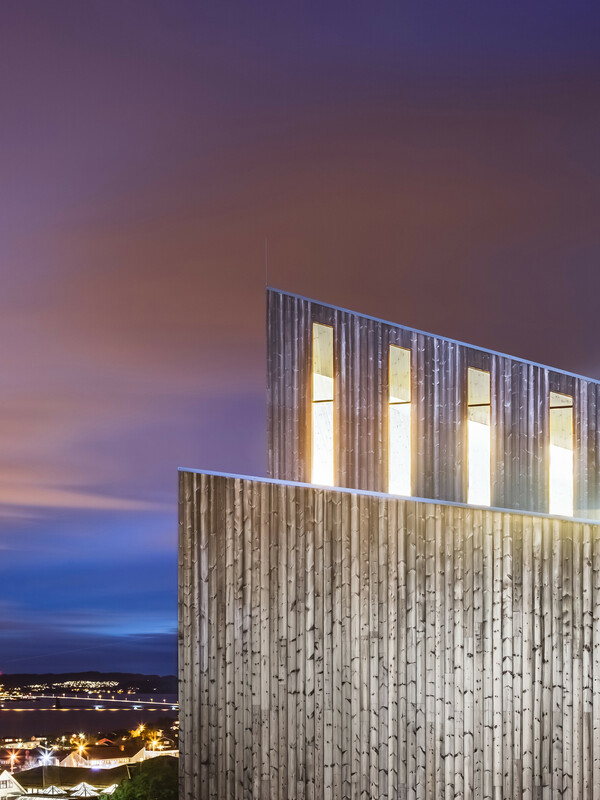 Such is this community church in Knarvik, Norway. 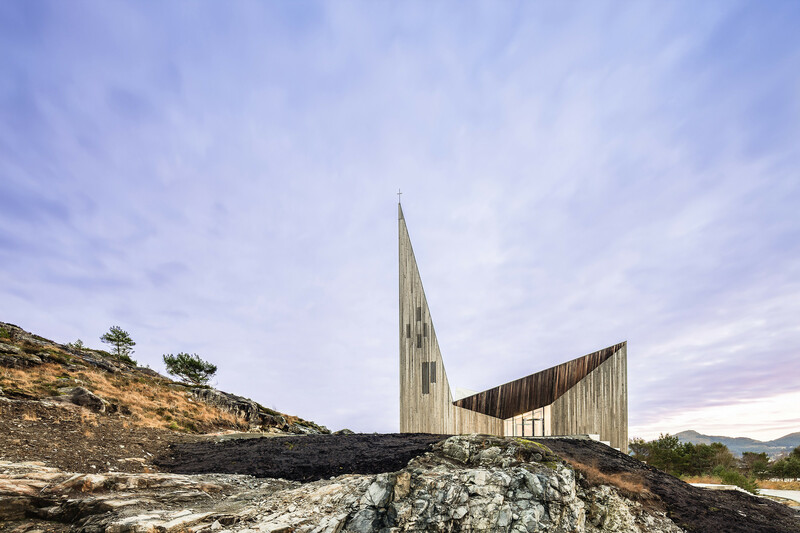 Bold, sharp, dynamic forms that not only sit well within its surroundings, but engage them in terms of colour, shape, and playing with the rocky forms upon which it stands. I love how the building articulates two different faces of wood. 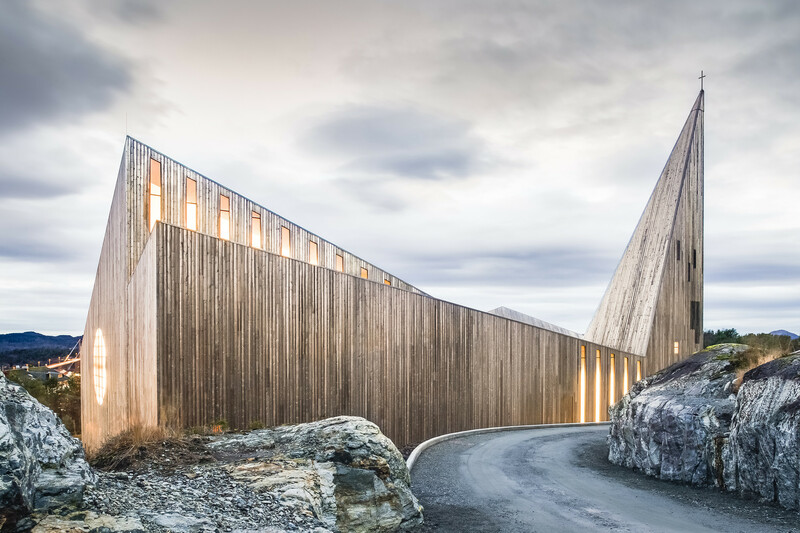 On the exterior, the weathered and rough wood further ties the building’s forms into recalling the rugged surrounding mountains. 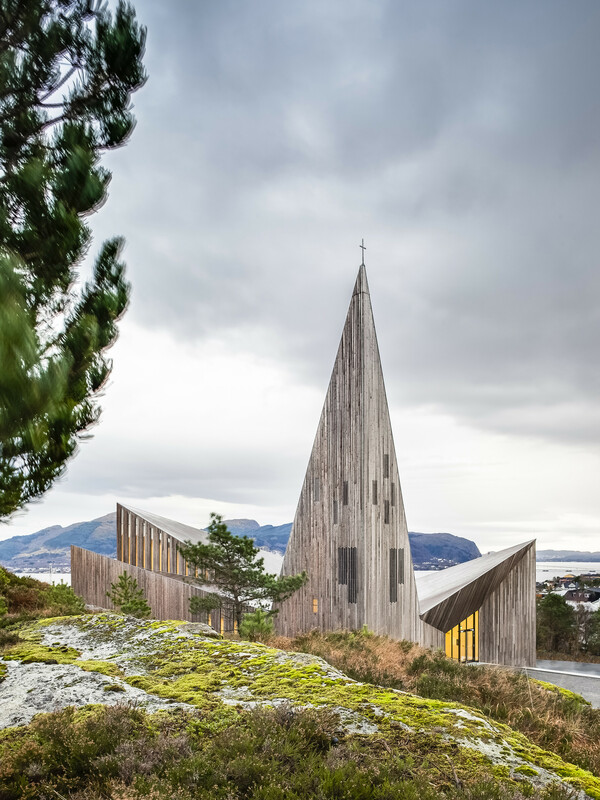 The heavily textured wood and strong vertical striations from the wood planks also provide scale and soften the bold forms, while also coupling beautifully with the equally tall and narrow windows. This pattern even continues on the roof, completing the effect of a form chiseled out of a solid chunk of rock. 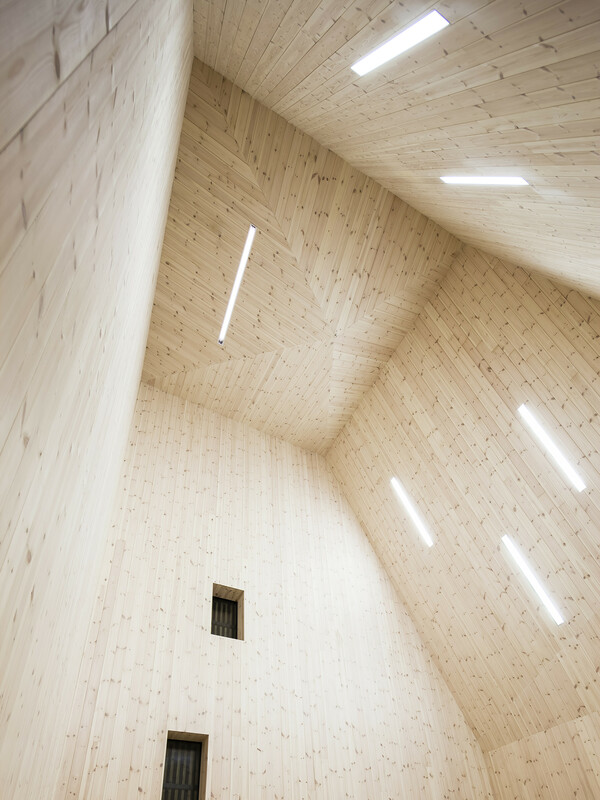 Inside, the wood panelling keeps the same plank form, but the wood is more pristine, being much lighter and smoother to create a warm glowing box. Delightfully, the expressive exterior carries fully within (really, it would have been seriously unfortunate if the sculptural forms were only skin deep), with spaces that shoot upward and outward, capturing grandeur and animating the rooms with a feel of elation. The positioning of the recessed lights marry well with the tall slot-like windows, that in turn meet up with equally narrow clerestory windows to bathe the space in glow. 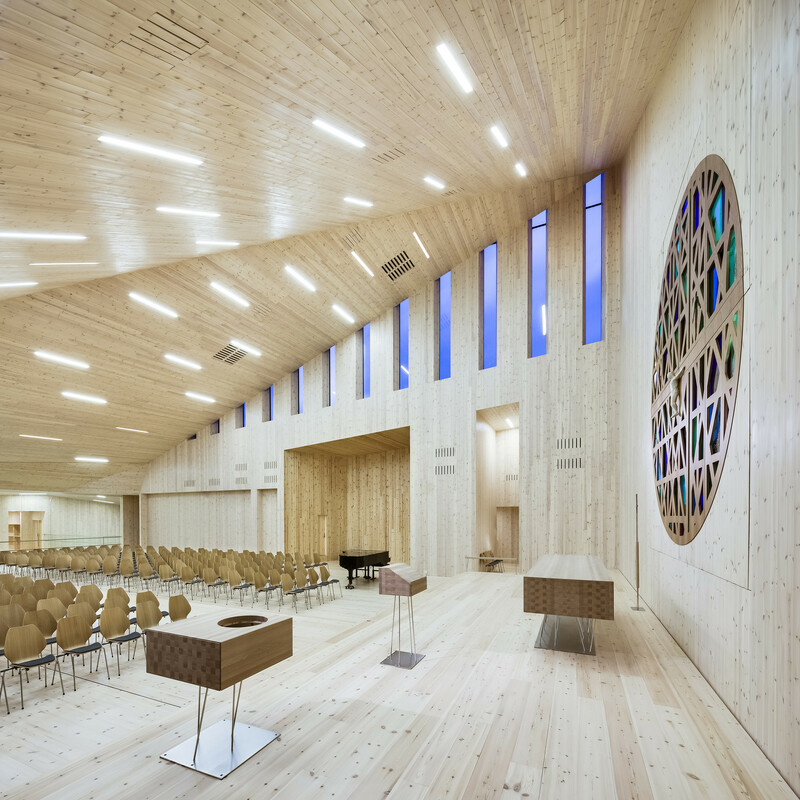 Quiet chapels, offices, and meeting rooms are located in the more sedate lower level, connected by a sculptural stair and auditorium-like seating that lets the two halves of the church operate as one. By using the natural slope of the site, the lower level is left exposed on two sides, allowing the same narrow windows to provide plenty of light and avoid any basement effect. 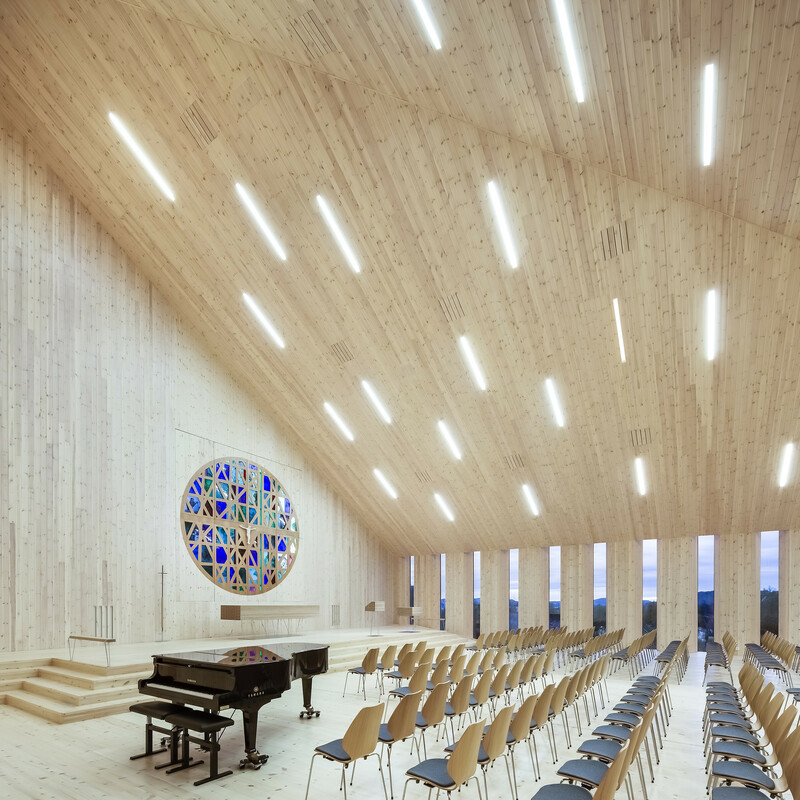 Right from the concept sketch the ideas of the church ring through, a play of landscape and form to create a jewel of a space for the community. It is a physical marker that speaks of place, while itself providing a great place to gather. Very fine work.